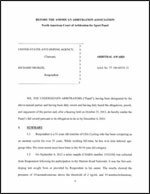 The United States Anti-Doping Agency (USADA) announced today that an independent panel of arbitrators from the American Arbitration Association (AAA)/North American Court of Arbitration for Sport (CAS) has ruled that Barney Reed of San Jose, California, an athlete in the sport of table tennis, committed a second anti-dopingrule violation. Reed, 30, tested positive for metabolites of cannabis or tetrahydrocannabinol (THC) at the U.S. Trials on March 3, 2007. Cannabinoids are listed as “specified substances” and are prohibited under the USADA Protocol and the rules of International Table Tennis Federation (“ITTF”), both of which have adopted the World Anti-Doping Code and the World Anti-Doping Agency (WADA) Prohibited List. Cannabinoids are listed as “specified substances” because they are less likely to be abused as doping agents. Reed received a 15-month period of ineligibility beginning on May 10, 2007, the date of his acceptance of a provisional suspension. As a result of the doping violation, Reed has been disqualified from his event results at the U.S. Trials, including his fourth-place finish. USA Table Tennis, the governing body for the sport in the United States, will carry out the sanction.